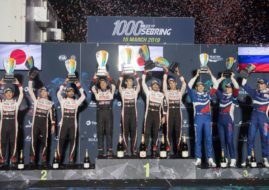 The 6 Hours of Silverstone, the third round of the 2018/2019 FIA World Endurance Championship super season, proved once more that the championship is in a fact the ‘FIA WEC duel of Toyota Hybrids’. 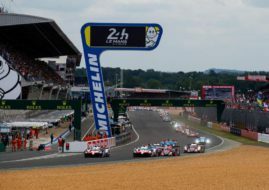 Toyota Gazoo Racing scored its third 1-2 victory and the crew in the #8 Toyota TS050 Hybrid defeated once more their teammates in the #7 car, unchallenged by any other LMP1 crew. Kazuki Nakajima, Sebastien Buemi and Fernando Alonso have a perfect score with three wins in three races, despite a fact that the #7 car was fastest in qualifying. However, Mike Conway, Kamui Kobayashi and Jose Maria Lopez finished again in the second place. Two Rebellion Racing’s crews dueled for the free place on the podium. In the end, Gustavo Menezes brought his #3 Rebellion R13 to the third place, one lap ahead of Neel Jani in the #1 Rebellion R13. Menezes was sharing a car with Thomas Laurent and Mathias Beche. It’s their third P3 in a row. In the LMP2 class, Jackie Chan DC Racing scored a 1-2 victory with #38 Oreca crossing the finish line 1.907 seconds ahead of the #37 Oreca. The drivers of the victorious car were Ho-Pin Tung, Gabriel Aubry and Stephane Richelmi. The drivers of the second-placed car were Jazeman Jaafarm Weiron Tan and Nabil Jeffri. Signatech Alpine Matmut’s #36 Alpine A470 finished in the third place in LMP2 class. The drivers were Nicolas Lapierre, Andre Negrao and Pierre Thiriet. The victory in GTE Pro class went to the #51 AF Corse Ferrari 488 GTE, driven by defending champions Alessandro Pier Guidi and James Calado. Porsche GT team took the second place with Gianmaria Bruni and Richard Lietz in the #91 Porsche 911 RSR. Ford Chip Ganassi’s Harry Tincknell and Andy Priaulx completed the GTE Pro podium in the #67 Ford GT. Dempsey-Proton Racing’s #77 Porsche 911 RSR was the victorious car in the GTE Am class, driven by Matt Campbell, Christian Ried and Julien Andlauer. Two Aston Martins, the #90 TF Sport’s car and the #98 AMR car, finished in the second and third place respectively.